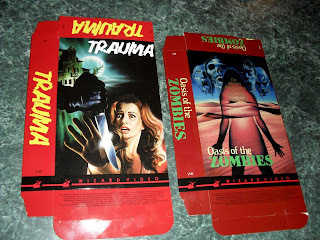 Yes another post about the new resurgence in VHS collectibilty. Charles Band, director and proprietor of Full Moon is throwing his hat into the ring. Charles Band originally headed the now defunct Wizard Video label during the original VHS boom of the late 70's. He certainly helped pioneer the genre back in the VHS days releasing some of the earliest and most memorable horror films onto VHS. Let's not also forget created and produced some pretty memorable horror films back then too. He recently announced the discovery of boxes containing unused 1000's of folded unused Big Boxes. One thing he did not find however were the tapes. Alas, he plans on using his original masters to create brand new VHS tapes to go along with these cardboard boxes. The newly created VHS tapes will contain the original feature along with new trailers, images, and featurettes. Starting in February he will release 4 Wizard titles each month until he finishes the run of 36 titles. Each title is limited based on the number of unused boxes he found and will run around $50 each respectively. For those completests out there there's also the option to subscribe to the set starting at the low amount of $600. Now Charles Band and his company have received a lot of flack from the DVD community regarding their handling of the OOP Puppet Master box set. At one point this set was fetching a pretty high price on the secondary market. Out of no where Band "found" a seemingly unending wealth of sets to sale. Apparently some were accusing him of reproducing the set multiple times in order to sale as an "oop collectible." Now I don't know the legitimacy of these claims, and while they are a bit old it certainly makes me wonder about these VHS releases. With the collectibilty of VHS in full force and a number of Wizard titles (Zombie, I Spit on Your Grave, etc) reaching double digits on the secondary market, this coincidence does seem to raise ire. Could this be Band cashing in on this craze? If you do a bit of math with the price of each unit and the supposed amount he found there is certainly a lot of cash to be made. This is a possibility that probably wouldn't shock anyone. At the same time it makes complete sense he would have these, he was the head of the company after all. Big Boxes were eventually phased out and replaced by the common cardboard slipcases so this could make sense right? He could legitimately do these re-releases and find success, Wizard is a very popular label with VHS affiianados. Which brings us to the next point. The Wizard fans. It's almost evenly split, some people are outraged with the notion, others are looking forward to picking up a few of the rare titles to complete their collection. There are some collectors who are relieved to finally complete the collection without dropping $100's on a few of the rarer titles. Some are completely irate at the idea that their collection and it's worth might be watered down by Band's re-releases. 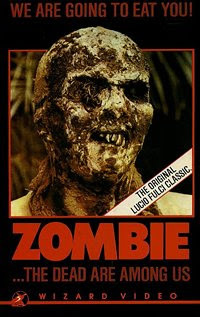 Never the less, I find myself intrigued and a little excited about the notion as I can remember a faded copy of Zombie gracing the shelf of Movies ETC. I've never owned it, but it's always been on my radar. The idea of finally being able to sit it on my shelf excites me, especially at such a low price point. The collector inside of me however scoffs at the notion of owning something that's not completely 100% authentic. One also has to wonder, while he has all the right in the world to release the big box sleeves, what about the film it houses? Doesn't Blue Underground now own the video and distribution rights to that film? I guess that's up to the lawyers to decide. A look at the boxes that were uncovered. For more information on the releases along with the opportunity to pre-order some of the titles click here.